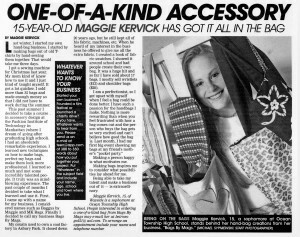 Designer Maggie Kervick stumbled upon her love for accessories by accident when she was fourteen years old. After a trip to New York City she decided to hand sew an “I Love NY” tee shirt into a tote bag. 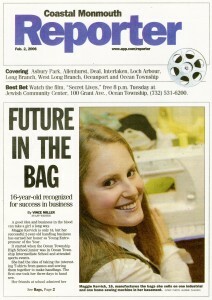 After wearing the bag to her high school, she found herself with forty orders. Maggie decided to put the business on hold while she attended the Fashion Institute of Technology, where she recently graduated. Maggie’s mission is to empower women to use condoms and teach women how to correctly use them by providing an informational pamphlet as well as free box of condoms as a gift with purchase. Her campaign is “I’m Covered” and hopes to break down the stereotypes that if a guy has a condom he is considered prepared, but if a girl has a condom she is considered a “Bad Girl”. 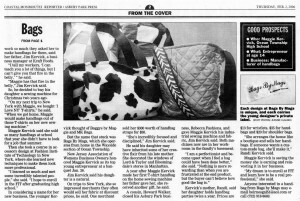 She wants her bags to be identifiable to all women because no one is invincible to AIDS or STDS.